Today i show to you my Christmas card. 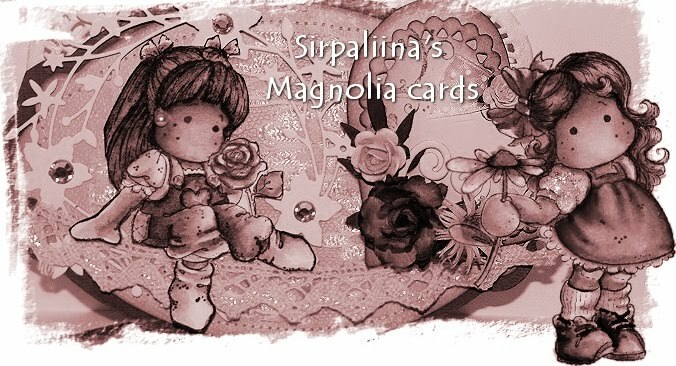 I use many different Magnolia's Stamps. you have to leave a comment at the end of this post. Merry Christmas and Best wishes for the coming year!!!! Wowwww, what a beautiful card. What a lovely nice details you used. Nice colouring. beautiful.. I love your scene Merry Christmas..
Aivan ihana talvinen tunnelma työssäsi!!! Tämä on kyllä upea!!! Absolutely adorable, I love every detail, very good! 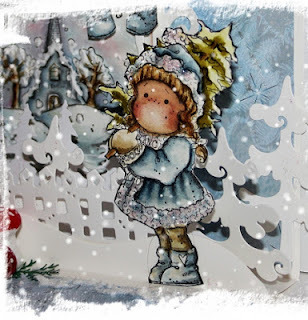 A super sweet and cute BRRRRRRRR winter card!!!! This is so gorgeous, and I absolutely love it. Both your wonderful coloring the lay out and the gorgeous blue shades is so perfect. Just stunning work all over it. Your card is fantastic and so is your colouring. I love how you put it all together. This is a gorgeous card! You've colored all the lovely images beautifully. Wow, this is so sweet and cute, love it. This is awesome. fantastic! So manny fantastic colored stamps. I am completly fallen in love. Very beautiful creation! Thanks for a chance to win. Merry Christmas! Wonderful! I love it, your colouring is great! I love the scene and the sweet Magnolia's! Your Christmas card with all those lovely Tildas is gorgeous. Your colouring is fantastic and I love everything on that card: the images, the colours, the embellishments. Love the whole scene and your colouring is amazing!!! Thanks to you and Magnolia for the chance to win a fantastic Christmas gift!!! Hi Sirpaliina, you made a wonderful Christmas scene with 3 adorable winterTilda's. Love your coloring and layout! Have a Merry Christmas and a Happy New Year! What a beautiful winter scene! It really looks frosty, snowy and cold! :)Merry Christmas to you! Your winter wonderland scene is very beautiful! Oh so very beautiful! The coloring is outstanding!!! Wishing you a Merry Christmas from USA Texas. Beautiful card! I love the scene, fabulous colouring. Wonderful winter wonderland... makes me dream. Have a lovely christmas period. The coloring is Wonderful! Congratulations! Adorable, your coloring is wonderful!!! How impressive! Such a beautiful little scene you've created. Love it! What a beautiful card! Love how you made a scenary of it. Lovely colours and embellishments. Great colouring! Wishing you a Merry Christmas and a Happy Newyear! You made a great christmas scene, your colouring is fabulous. Merry Christmas to you from Tina M.
What an awesome card you have done! Love your colouring. Merry christmas! And Thanks a lot for the chance to win. Love the blues and white. Such a pretty scene. aivan ihana kortti ja kivoja yksityiskohtia. Adorable card! Colouring is very wonderful! 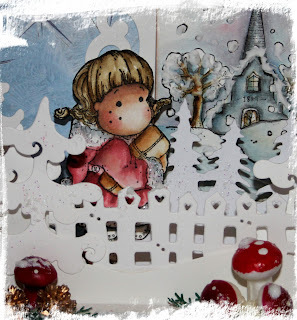 Beautiful scene, love the colours and I really must try and find that background stamp. Gorgeous. Wow... this scene is amazingZ!!! The colours and your colouring are stunning. I love every single details. WOW this is great i loved it very much, nice colours and everything. Wow..., your scene is wonderful, what a great work !!! WOW!!! I love this project. The stamps are all beautifully coloured. I especially love the old Swedish church. Great job! Amazing! Thanks for giving me the chance! WOW, beautiful scene, like all the stamps and how you put them together and your colouring is just amazing:) Merry Christmas! Beautiful card! Love the winter scene! Beautiful colouring and layout thank you for sharing your creation with us. 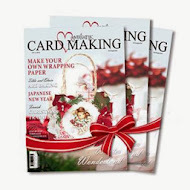 Your card are amazing! Very beautiful! WOW this is just gorgeous, I love all the sparkle and glitz. So cute and I love all the details, Merry Christmas. You have made such a nice scene composing this lovely Tilda's. Gorgeous coloring work!! What a fabulous card, I love the way you have built a scene with all the characters, and all the extra little details as well. Very pretty work and very pretty colored so; It´s fantastic. Congratulations. Wonderful!! This is a stunning card!! I loved all the details and the colouring is fabulous. Congratulations!! Beautiful card! All the detail put together so nicely! Thanks for sharing on the Advent Calendar! A lovely &, to me, a fun card. So much to look at in it. Thanks for making it for the Advent calendar cards.